About a week ago we shared the first official comparative Nvidia GeForce RTX 2080 game performance indications directly from the green team. Nvidia published a chart showing the gains delivered in a host of popular and new games when using a GeForce RTX 2080 in place of a GTX 1080. It is thought that Nvidia was prompted to release the chart after murmurings that the new RTX series was all frilly ray tracing and no 'trousers'. Furthermore, there were indications that the best 'RTX On' visuals came with a big impact on games performance. Today we have found some more reassuring figures which show that the new RTX cards can provide significant performance uplift compared to the previous generations in the games we play now. 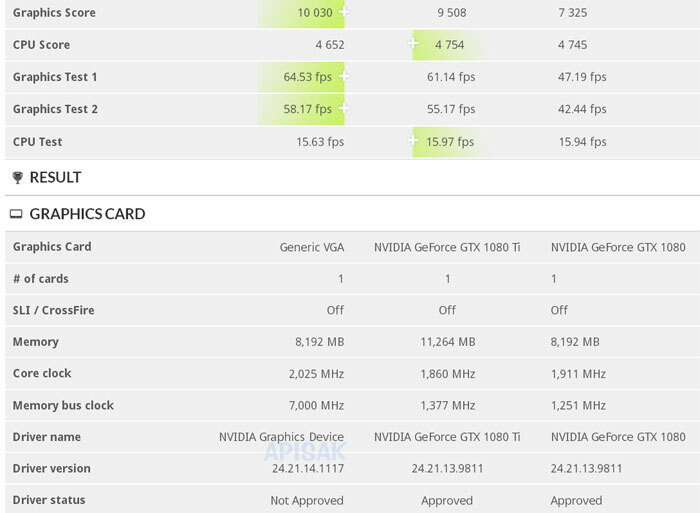 VideoCardz and Thai overclocker Tum Apisak have both revealed what are claimed to be 3DMark Time Spy scores for the GeForce RTX 2080. This benchmark should give a good indication of current/modern gameplay performance and is used by HEXUS in GPU reviews, like this one of the Sapphire Radeon RX Vega 64 Nitro+. Apisak's screen grab, above, shows that the Nvidia GeForce RTX 2080 3DMark Time Spy score is 10,030: approx five per cent faster than the GTX 1080 Ti, which scored 9,508; and 35 per cent faster than its predecessor, the GTX 1080, which achieved 7,325. Moreover, the 3DMark Time Spy score of the RTX 2080 is very similar to that of the Titan Xp. Further info gleaned from the benchmark data says that the tested graphics card came with 8GB of memory and a 7GHz memory clock, delivering 14Gbps effective. Even better performance could be squeezed out of the new RTX 2080 by the time they are available thanks to improved and approved drivers and games optimisations. 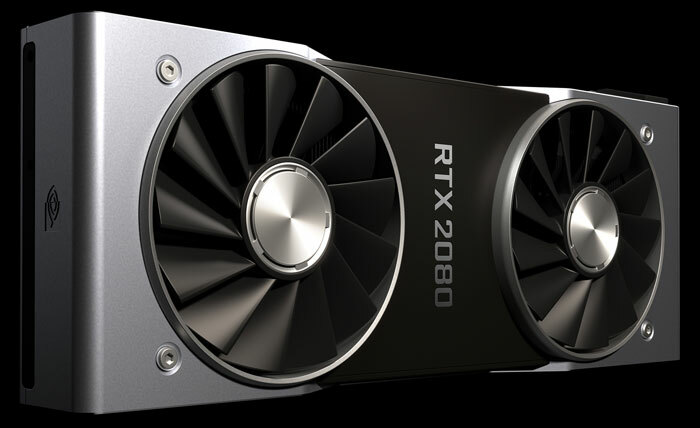 I've just checked prices over at SCAN UK and the cheapest RTX 2080 cards are approx £715 to pre-order. Those are about £100 more expensive than the cheapest GTX 1080 Ti cards available from the same store, at the time of writing. £100 more for only a ~5% performance bump? Really? I know they've added some new-fangled features, but they aren't going to be utilised properly for a long while and won't benefit performance anyway. What are they playing at here?? They're playing the ‘we’ve cornered the market and we can charge pretty much whatever we want' game. Guess I'll be keeping my 1080 until the 3000-series drops then.